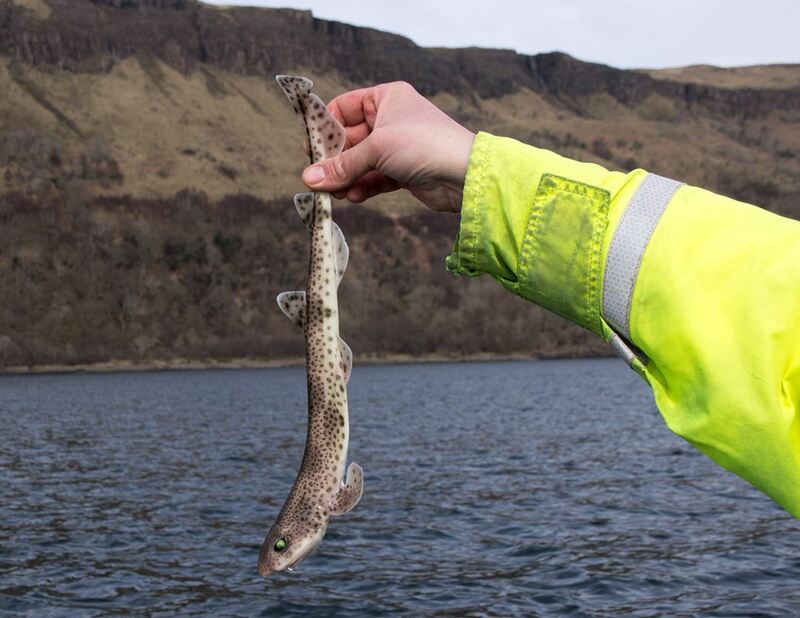 Hopefully it should be onwards and upwards for the next month or two, as the east coast picks up with the summer codling and Galloway beckons for another trip in June. Here’s hoping, anyway! A little while later and the gentle SE breeze still managed to cut right through us as we waited for the boat to settle at anchor. Skate were the target, but getting a bacon roll and a hot coffee on the go to ward off the chill felt more like my priorities. However, even with 530 feet of water below us, it didn’t take too long to get the baits out and settle down to defrost. 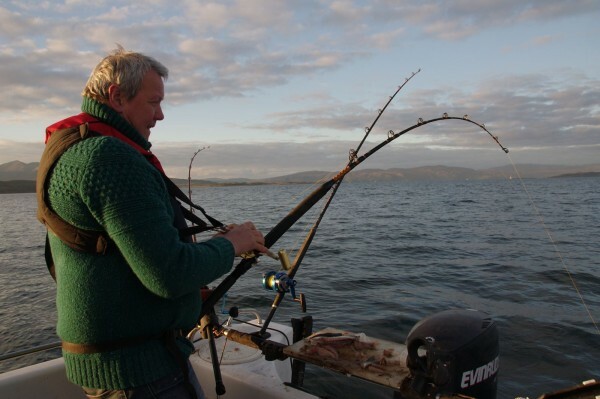 Maybe half an hour passed before Ian’s rod keeled over to the steady run of a skate. I went into cameraman mode for a few minutes, until the ratchet screeched on my own reel (the ratchet on an Avet reel is definitely not subtle, and makes a horrible racket). 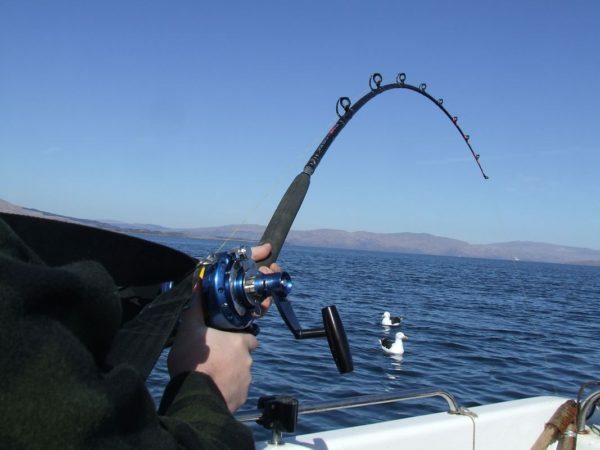 A double hook-up!! 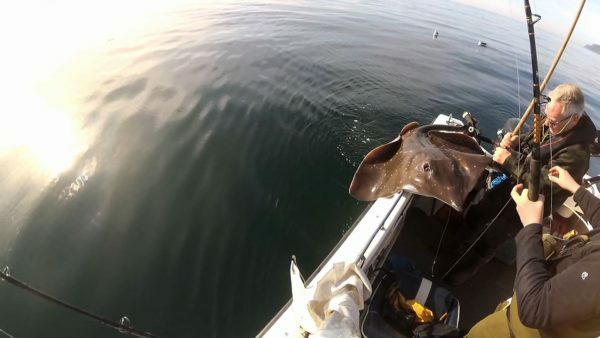 Whilst it’s all very nice to know that there are skate around, hooking two simultaneously creates a wee bit of a problem in a small boat. 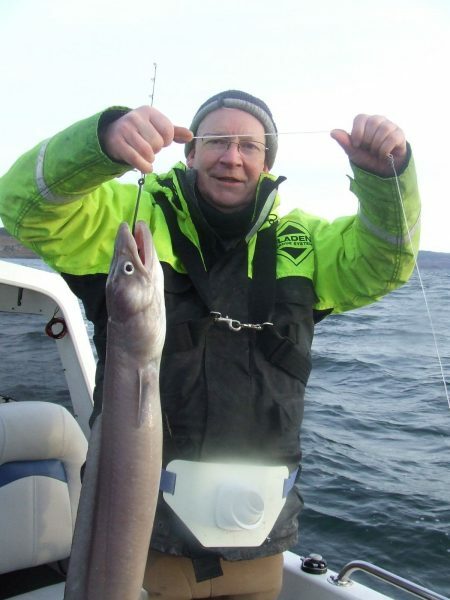 The obvious difficulty comes after 20 minutes of exhausting, backbreaking, slog when you bring the fish alongside. 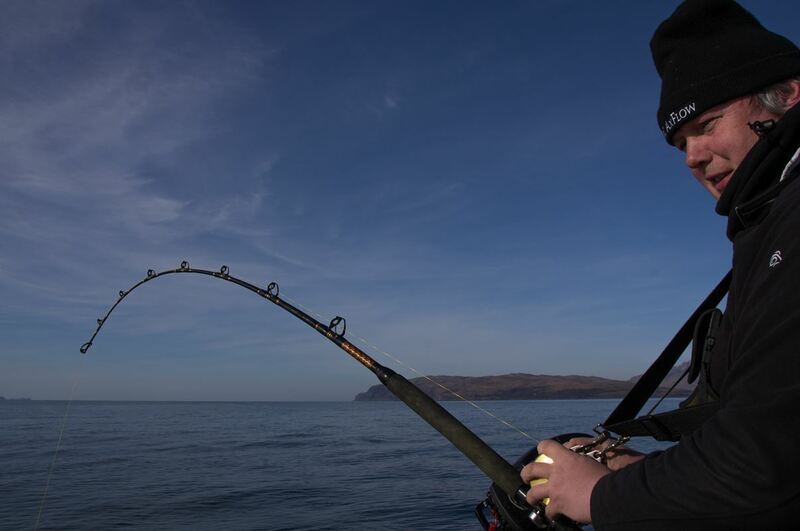 Trying to haul one fish over the gunwhale without losing the other as you do so isn’t easy, especially if you’re both a bit knackered. 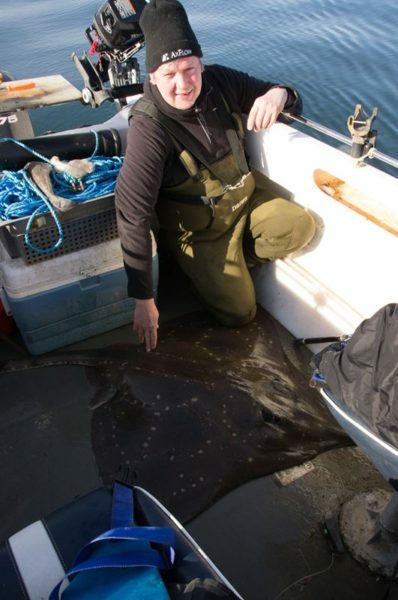 However we sort of managed and filled the cockpit with a brace of skate – almost identical males in the 120-130lb bracket. Hasty measurements and a photo or two and then they slimed their way back over the side and into the depths again. A new coalie on the hook and then it was time to get serious with the bacon rolls as we’d definitely earned one by now. Another good run to my rod came to nothing, but a repeat a few minutes later hooked me into a small skate. I wasn’t complaining though, and this little 32lb fish was a lot easier to handle than its predecessor. 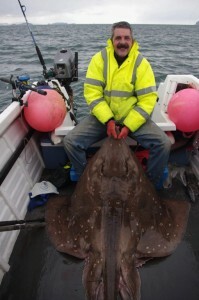 The rest of the day proceeded in similar fashion and we ended up with six skate in total, with the best around 169lb. 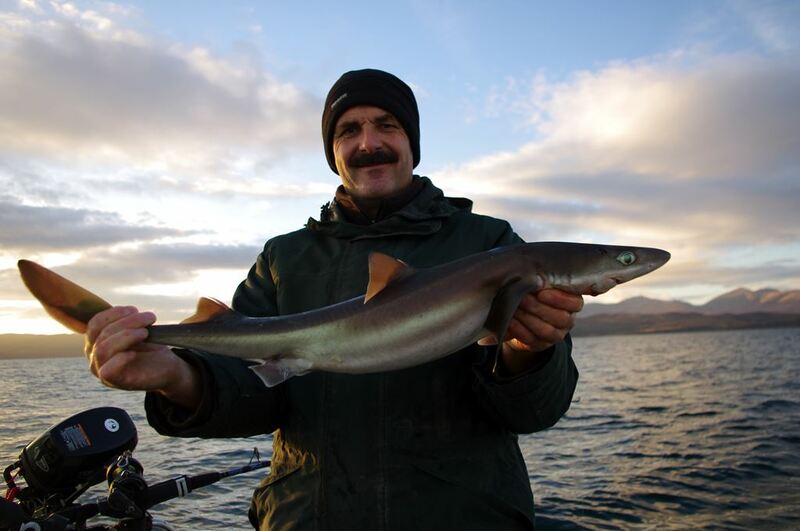 Ian had a number of smallish spurs to his lighter rod and I also picked up a bonus of a small conger, something I’ve never caught round here before. We stuck it out until the sun set before finally hauling yet another heavy weight from the seabed as we retrieved the anchor. Job done, we headed home cautiously in the dark, looking forward to defrosting in a nice warm car. 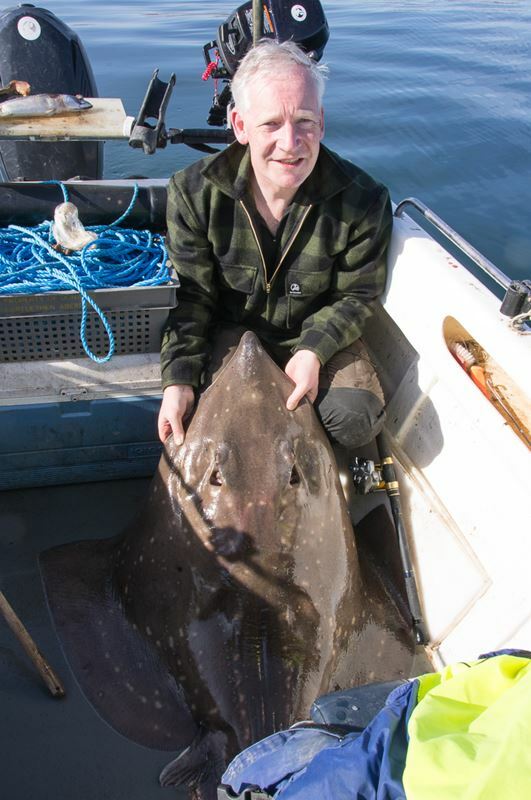 Six common skate and a similar number of spurdogs, not forgetting a small conger, makes a pretty good start to the year in my book! To be quite honest, being an ageing office worker with the upper body strength of a 10 year old means I don’t always relish the chance to play tug of war with a skate almost as big as myself. 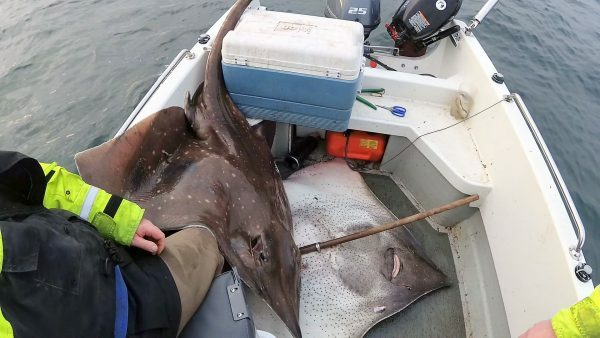 I’m neither particularly keen or successful as a skate fisherman, but a great forecast, small tide and late March meant I didn’t have a many other options on the sea fishing front. So a trip to fishing for skate at Oban was on the cards, with Ian recruited as crew. 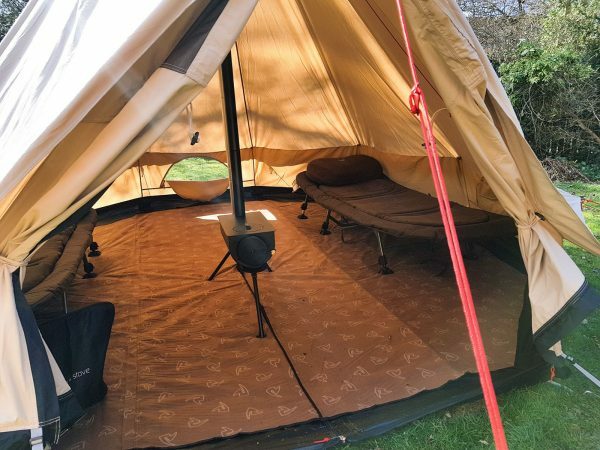 This was to be a two day effort, with an overnight camp in between, which meant a lot of scurrying around to sort out gear beforehand. It was a leisurely start on Friday and we launched at Ganavan around 11, just after low water, and headed out into a very calm Firth of Lorne. 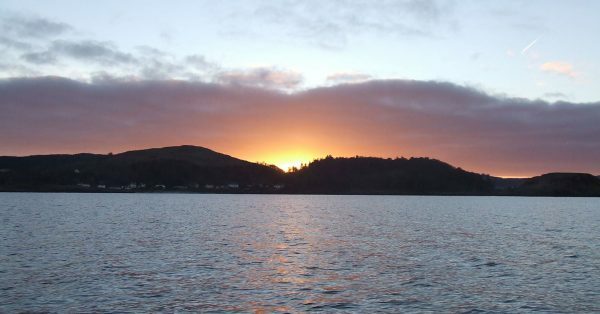 The plan was to revisit the Lochaline area as I’ve not tried it for several years. 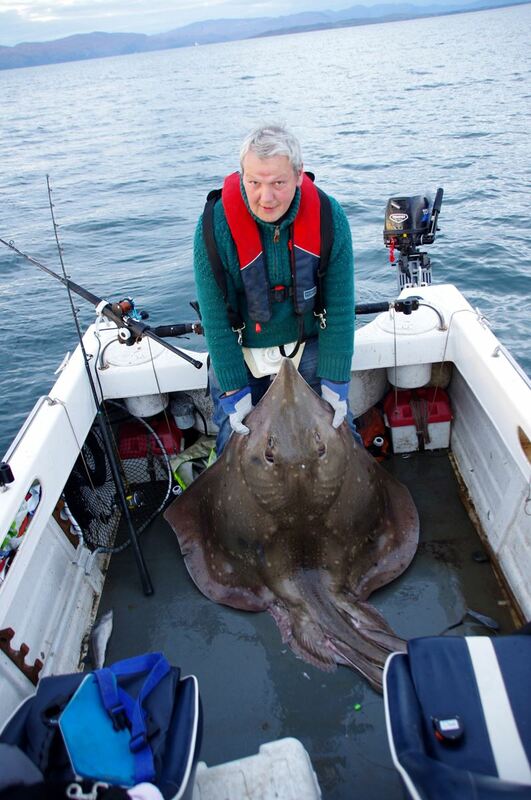 Well, we fished for around 6 hours without so much as a sniff from a skate. Ian was fishing a lighter rod and picked up a grand total of 3 doggies, whilst I spent more time watching the eagles on the cliffs above Inninmore Bay. An utter waste of time, and not a great omen for Saturday. 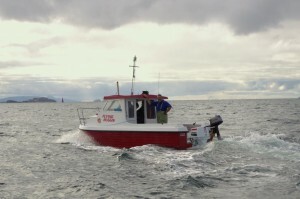 I hauled anchor with my tail thoroughly between my legs and we headed off to find a spot to camp overnight. 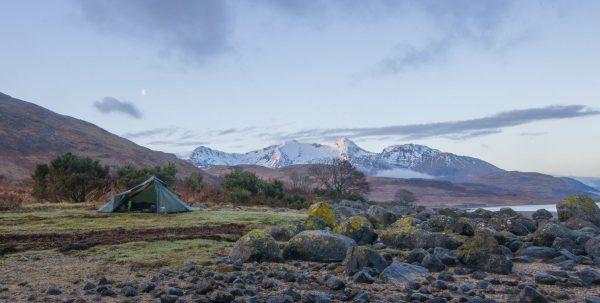 We (eventually) got tucked up for the night at my second choice, a remote little bay on Mull not far from the entrance to Loch Spelve. It proved a fairly tight spot to moor in but at least there was a great little spot to pitch a tent overnight. 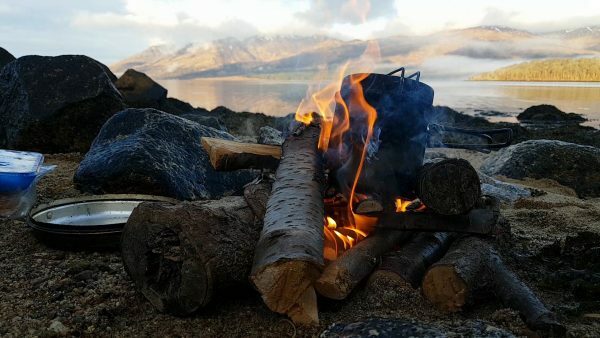 After a dinner consisting mainly of half-cremated sausages we turned in early for the night. A remote and isolated site together with a cool, starry and midge-free evening – pretty much the way I like my camping! 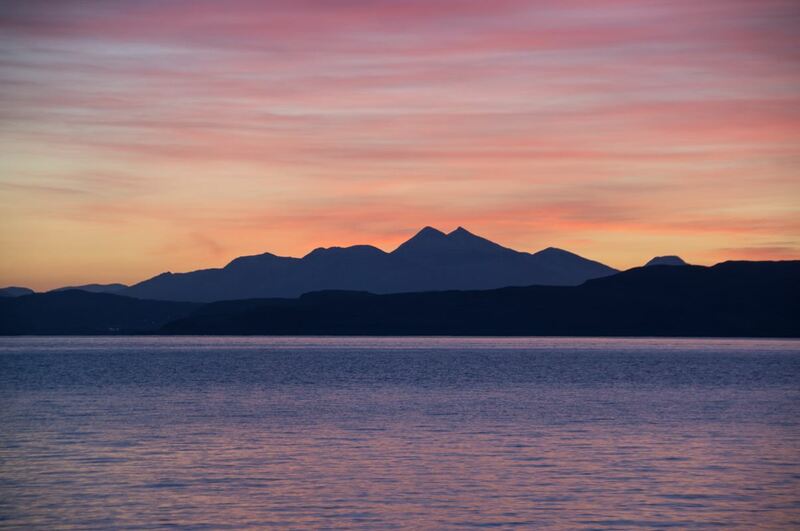 Next morning I was up early, mainly to make sure the boat was still there (and floating), and was rewarded with a fine sunrise over Ben Cruachan and Kerrera. 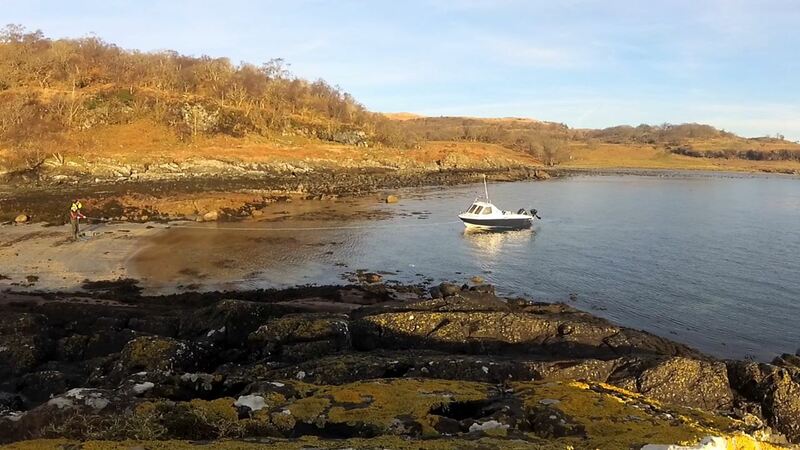 Coffee and breakfast was followed by re-stowing everything on the boat and undoing the overnight mooring, However we were soon heading out towards my usual marks near Kerrera and fishing before nine, or around 90 minutes before slack water low. 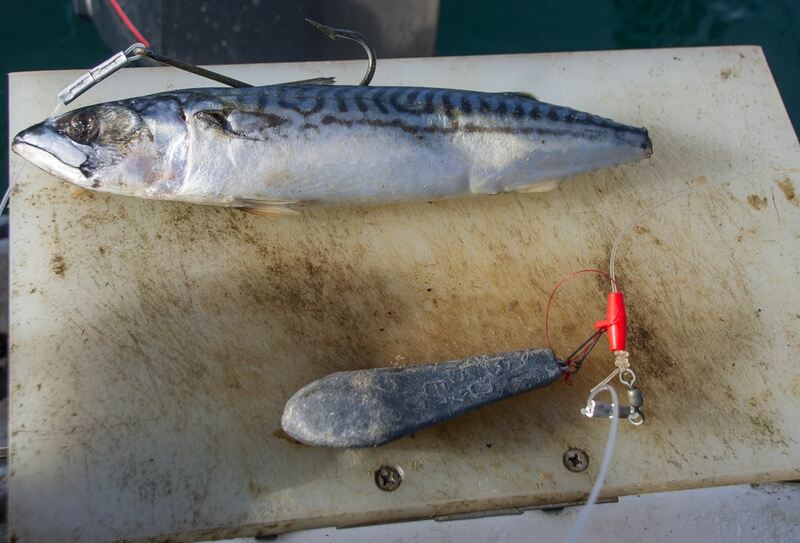 Water depth was 515 feet and I was using a 2lb lead to get a whole mackerel down and pinned to the muddy seabed. Mackerel isn’t my first choice of skate bait where there might be spurdogs out to play, but with Ian possessing the one respectable coalie we had between us there wasn’t much choice in the matter. 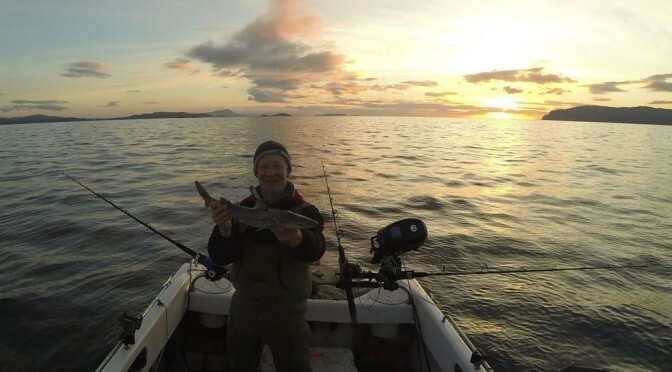 In the event it didn’t seem to make any difference as there was little in the way of spurdog (apart from one nice but skinny specimen for Ian), and the skate liked the mackerel just fine. 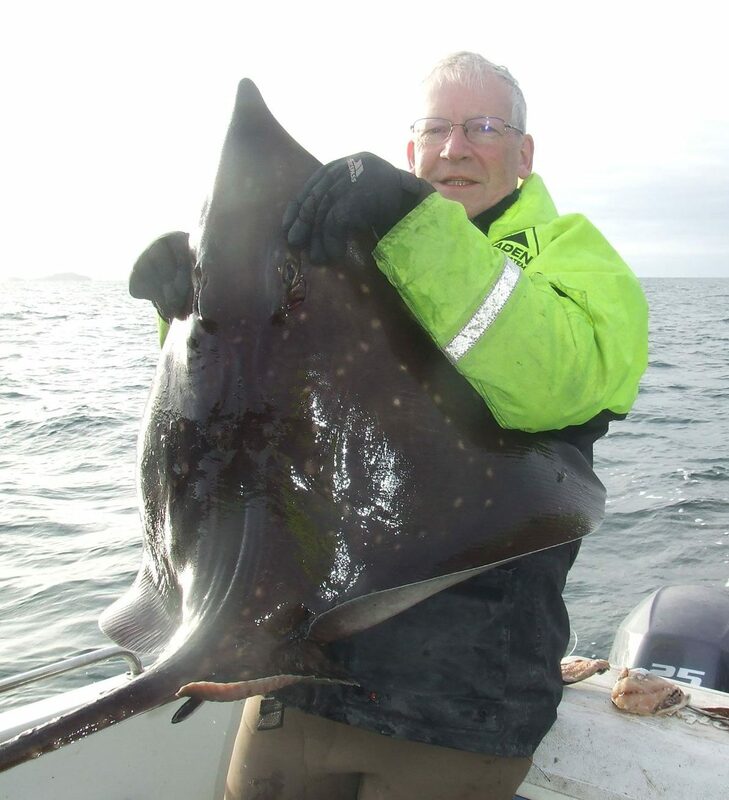 I won’t bore you with the full details of every capture, but we hoisted 7 skate to the surface and had two more throw the hook. 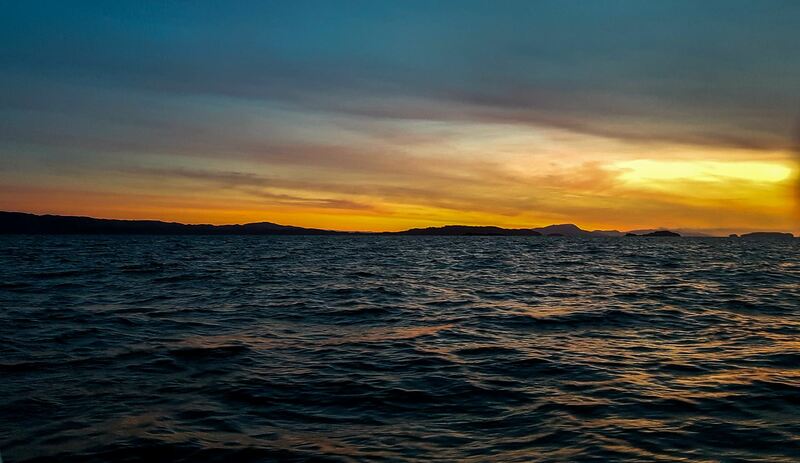 That is waay better than any day I’ve had previously – I think the most I’ve had aboard Alcatraz before is just 3. 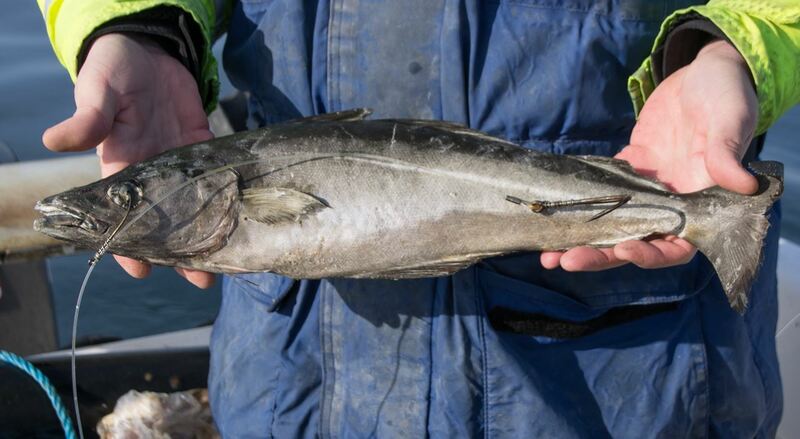 Most of them were small(ish) males but the biggest was a female that looked to be in the 150-160lb bracket. The tide was pulling her under the boat and we were both getting knackered by that point, so we didn’t pull her aboard. Maybe a bit more, maybe a bit less, but I can’t say the precise weight bothers me too much. Apart from that, all the others did scrape over the gunwhales, with the best being a male of 107lbs (we had 4 males and 3 females in all). It had some sort of tag fitted, of which only the black circular base remained. 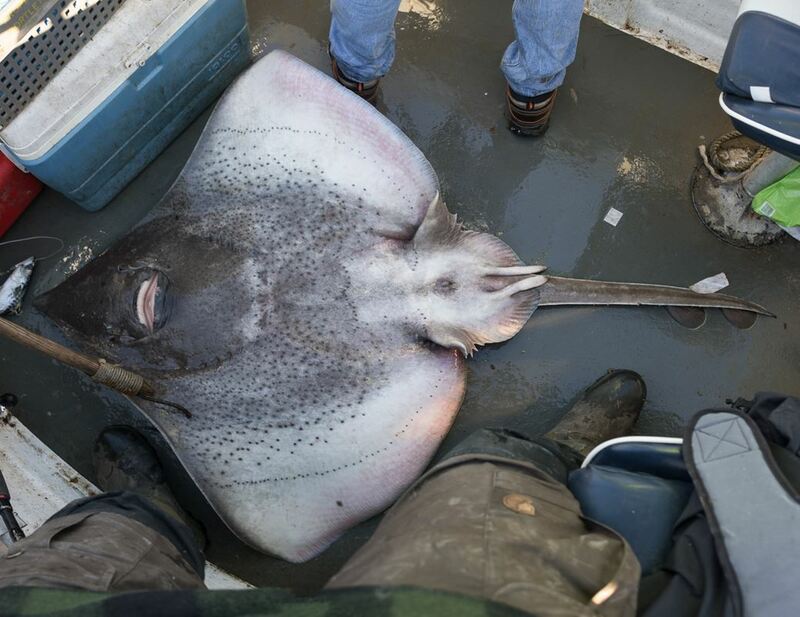 There wasn’t any identifiable number on this one, so it was possibly one of the few skate tagged with a radio beacon – if anyone can shed light on this that would be great. Ian also managed the dubious honour of being the first person I’ve ever seen to get bitten by a skate. Probably more of a glancing blow than a full on crush your hand effort, it still did a fair bit of damage and certainly looked impressive with a nice pin cushion effect. 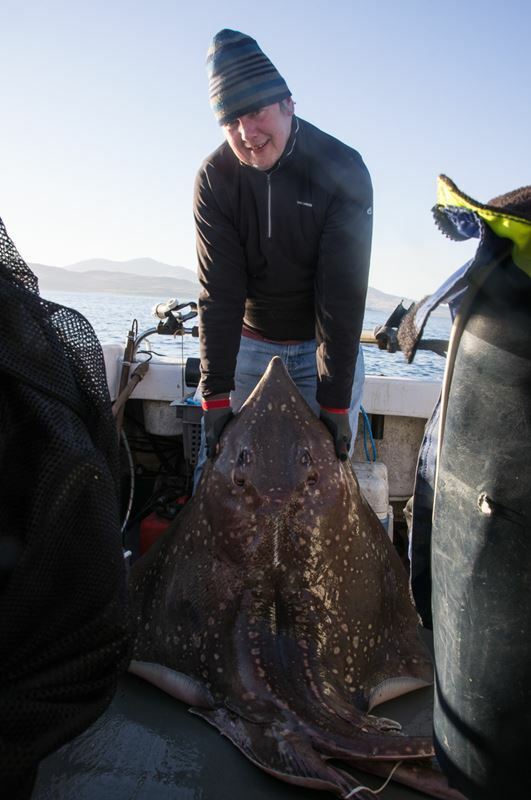 This was a particularly pissed male skate which was quite aggressively trying to bite anything it could and managed to extend its jaws just as Ian extended his pliers to remove the hook. Oops! Ian suffering after getting too close to a skate’s jaws. Note the lovely pincushion effect! 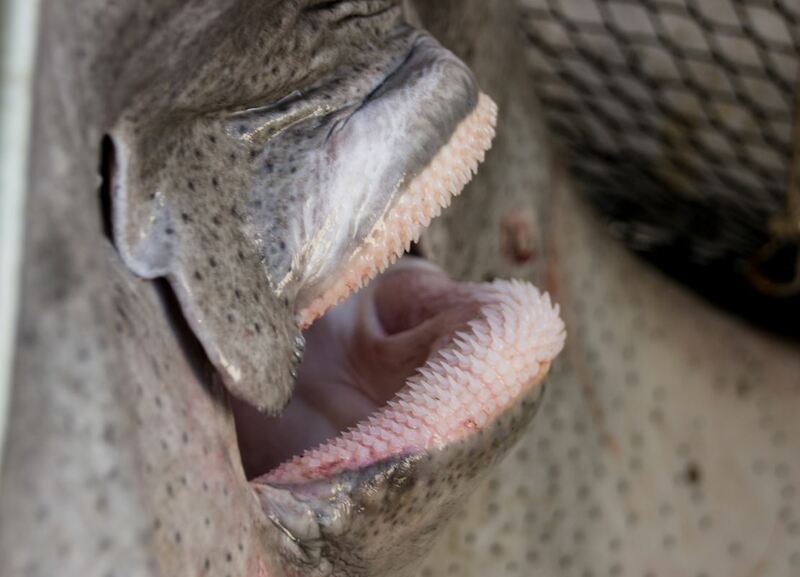 The mouth of a common skate bristling with sharp, backward pointing, teeth. After swabbing copious quantities of Ian’s DNA from Alcatraz’s decks and covering his hand in band-aids we got back to fishing again. Slack water high was about 4.20 and I reckoned we could give it another 90 minutes after that before the tide picked up again. 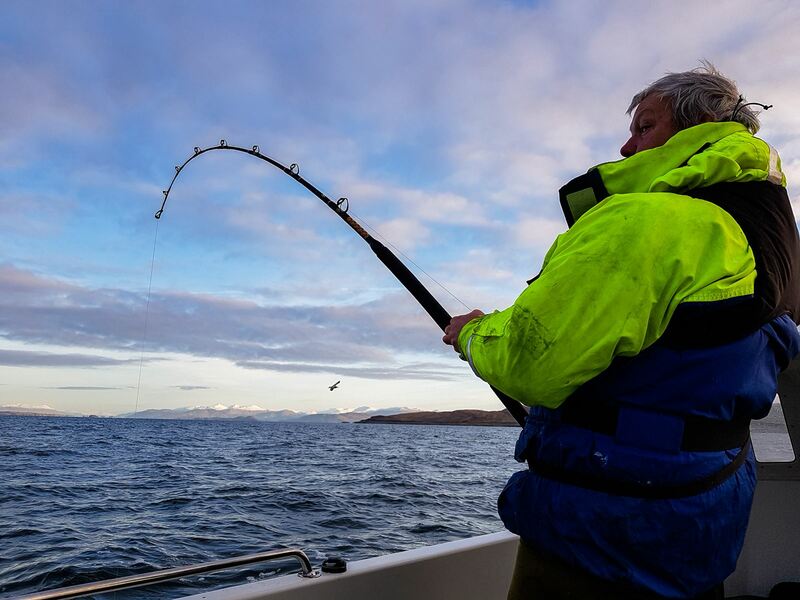 In the event that was pretty much spot on, as I pulled up a small male of around 60lbs – and no sooner had that hit the deck than Ian was into another fish, again a male, which gave a good account of itself before coming aboard for a photo opportunity. By this time it was well after five, so we decided to call it a day and head in whilst our backs were still just about in working order. 4 to me and 3 to Ian, and both of us happy with our lot, bandaged fingers notwithstanding. I’m not sure I’m converted to skate fishing as such, but it was a great way to spend a couple of days in a beautiful part of the world. 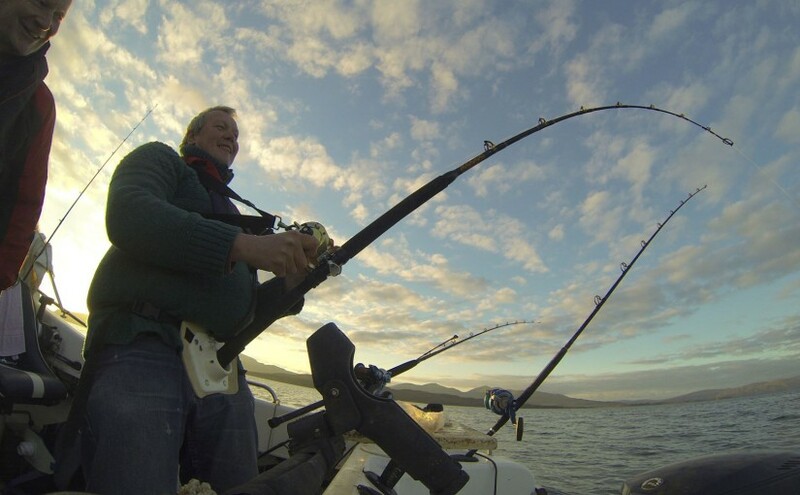 It was a bit of a toss up whether to head to Etive or carry on a bit and try fishing for skate off Oban, but a combination of small tides and calm weather tempted Ian and I into a spot of skate fishing from Gallanach. My reservations about skate hunting were further overcome when the sun came out big time and I could safely settle down for a snooze whilst waiting for some action…. maybe. Apart from a few dogfish on small baits, a snooze was as good as it got all the way through the ebb, and I was pleased to catch a couple of modest spurdogs to add a little excitement. About 90 minutes into the flood tide, and with the sun almost setting, Ian’s rod finally got some action with a fish that messed around for several minutes before Ian set the hook. 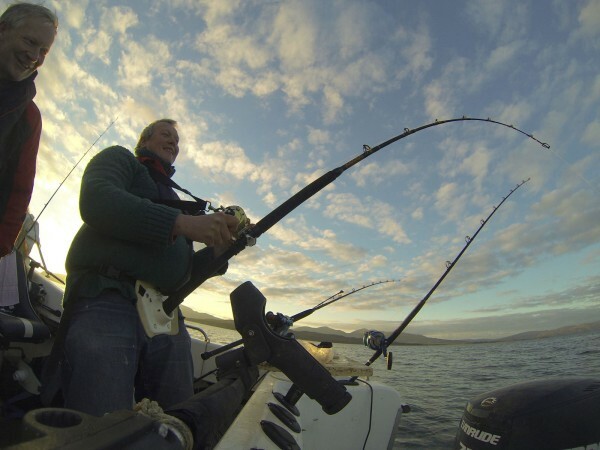 This fish played around in the tide, alternating some fairly easy retrieval with powerful dives that left Ian struggling to stop it. However experience gradually told and the familiar outline of a decent fish eventually emerged, kiting gently in the current. A quick haul in for a few photos and back it went – later confirmed at 103lbs on the size tables. Not a monster but a fine male fish nonetheless. 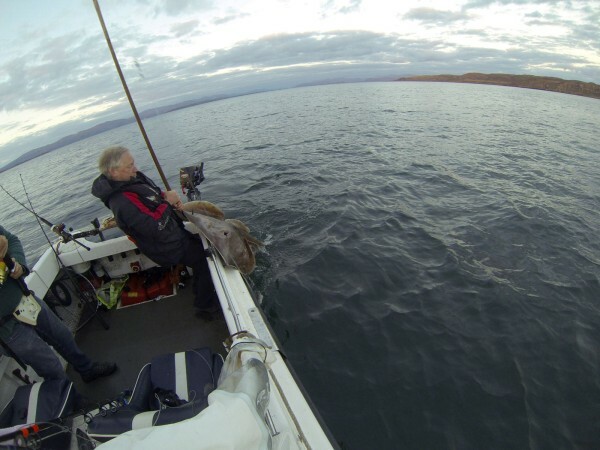 By now it was getting dark and time to haul anchor from 500 feet below us, before heading back to Puffin Dive Centre at Gallanach, and then home, via the chippie at Oban. 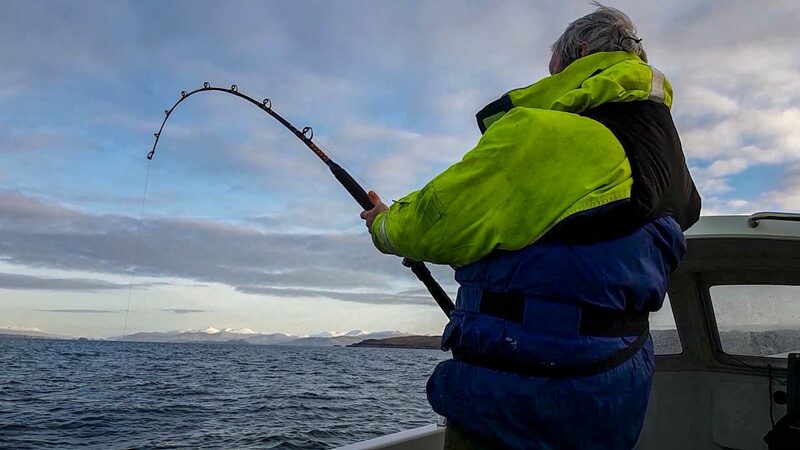 I’m always a bit wary of Oban – there’s some big fish around but it can be pretty hit or miss with a lot of waiting around between any excitement. 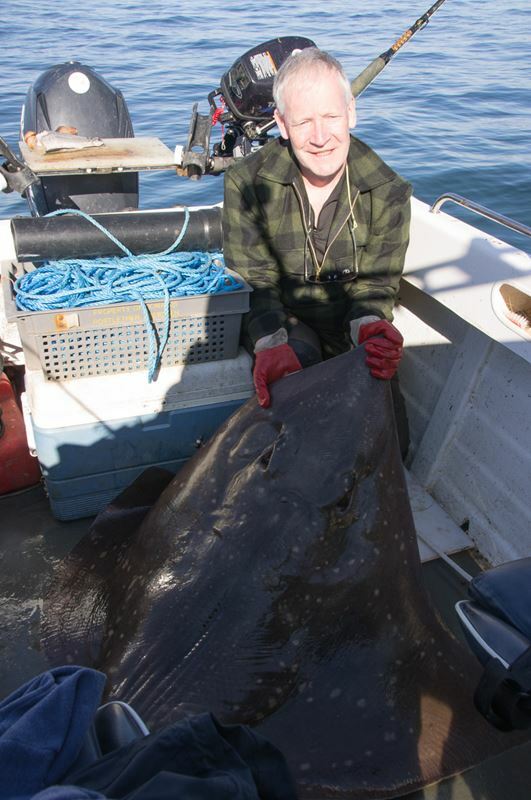 And hauling up a large skate in over 500 feet of water is a taste I’ve never really acquired, all of which perhaps explains why I’m not a frequent visitor. That said, standing on the pier at Puffin Divers with Trevor I managed to overcome my inhibitions and slight unease at the cool November breeze blowing in from the east, and we were soon heading down the Sound of Kerrera and round to the deep water lying between it and Mull. 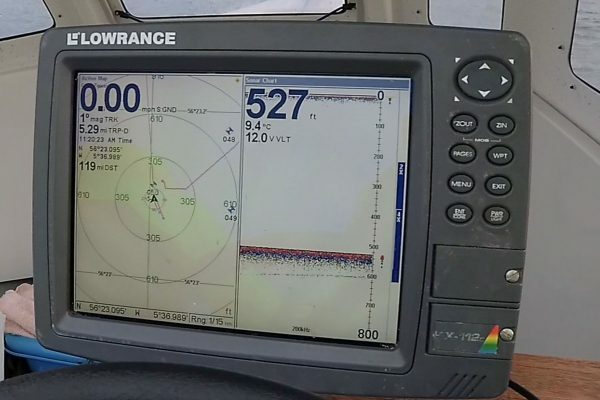 At 520 feet deep and quite close inshore it wasn’t much of a challenge to find and drop anchor on our normal mark – although staying on it and fishing effectively was a little more awkward in a fairly stiff breeze that saw us drag appreciably through the mud on 2 or 3 occasions during the morning. We bounced around quite a bit as we waited, and waited – and waited. 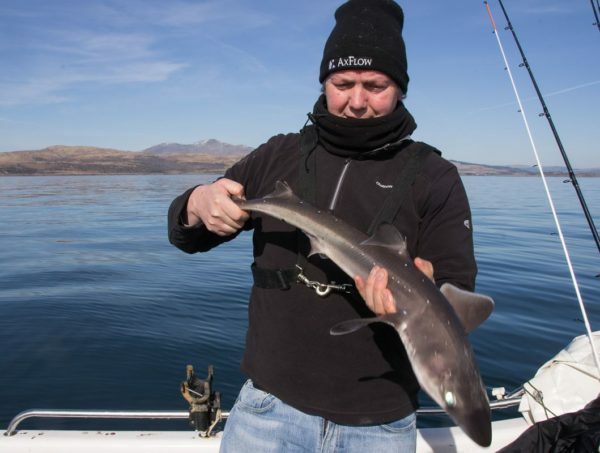 Even bacon rolls and several mugs of coffee didn’t entice anything other than a couple of dogfish out to play, until I finally got a decent run just after HW. It didn’t seem to be messing around, but there was nothing there when I wound down into the fish 🙁 Trevor repeated the experience about 20 minutes later, on quite possibly the same skate, and we then reverted back to a trickle of dogfish and a couple of smallish spurdogs during the afternoon. In the later afternoon the breeze died away as the sun started heading towards the horizon, and it was positively pleasant by the time the stars came out to play and we weighed anchor for the run back to Gallanach. Chuck in a few more fish and I might even be tempted back more often, as I’m a sucker for scenery and sunsets! And a final highlight before trekking home to Edinburgh – a superb fish supper at the Oban Fish Restaurant, something to very much look forward too after a day afloat. 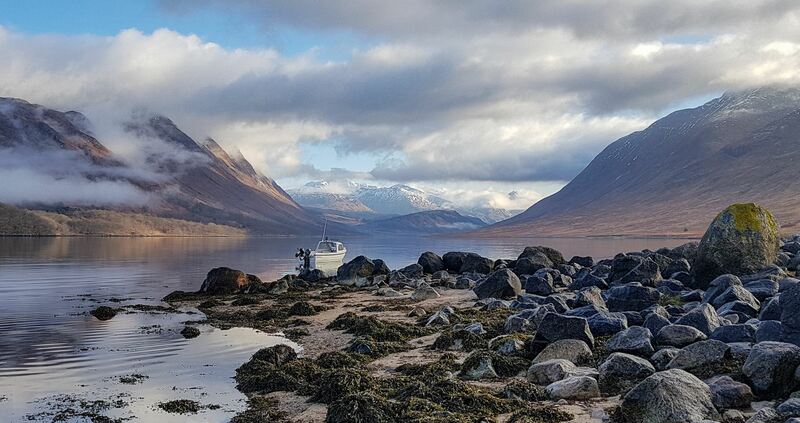 End of March and it’s been bitterly cold and snowy for the last 2 or 3 weeks, with a stiff easterly breeze dampening any enthusiasm at all for fishing. Unfortunately Trevor had a week’s holiday booked and wanted a bit of company for at least one day’s fishing so I rather reluctantly booked a day off work on the Tuesday and we agreed to meet up at the Puffin Dive Centre. The tides were a little on the large side, and the forecast a 10-15 easterly so my hopes weren’t too high when I packed a skate rod in the car alongside a coalie or two and headed westwards. 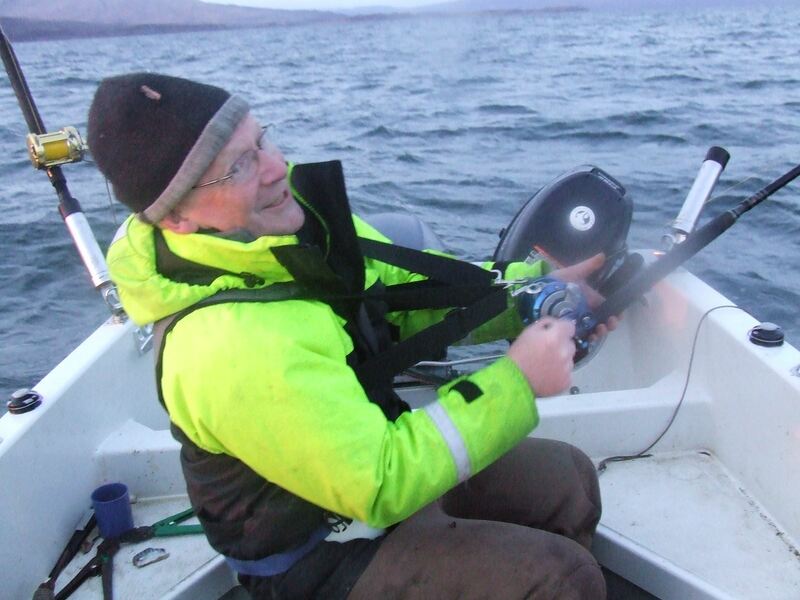 Trevor had Flying Huggis – an Icelander 18 – in the water already, and was his usual enthusiastic self as we prepared to head off. 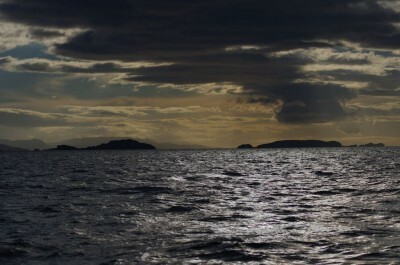 Even the weather looked fine enough, so my early pessimism lifted as we headed down the sound and round the south side of Kerrera before settling on our mark. The tide run was fairly substantial but manageable and we sat happily enough at anchor for an hour, then another hour, until suddenly Trevor got a modest run which dropped the bait. 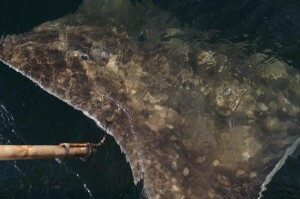 All alert now, leaving his bait on the bottom proved the right decision as the fish came back another couple of times before it was finally nailed and Trevor was faced with the long haul from the sea bed 500 feet below. Despite applying plenty of pressure it was a good 25 minutes, and several nice runs, before a substantial shape materialise alongside the boat. 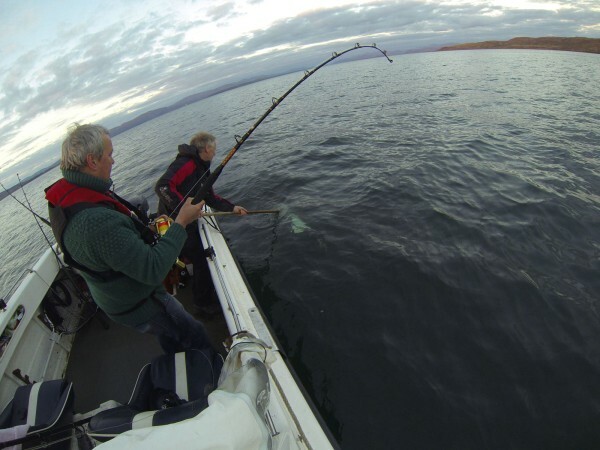 Once safely gaffed and aboard we realised that this was a nice male fish, which was later checked at 121 lbs on the charts. 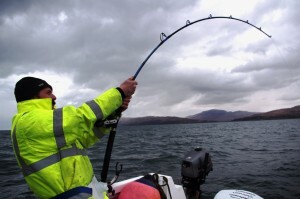 A couple of bacon rolls later and Trevor had pretty much recovered from fish number one when his rod went again. No messing about with this fish and it was hit first time. 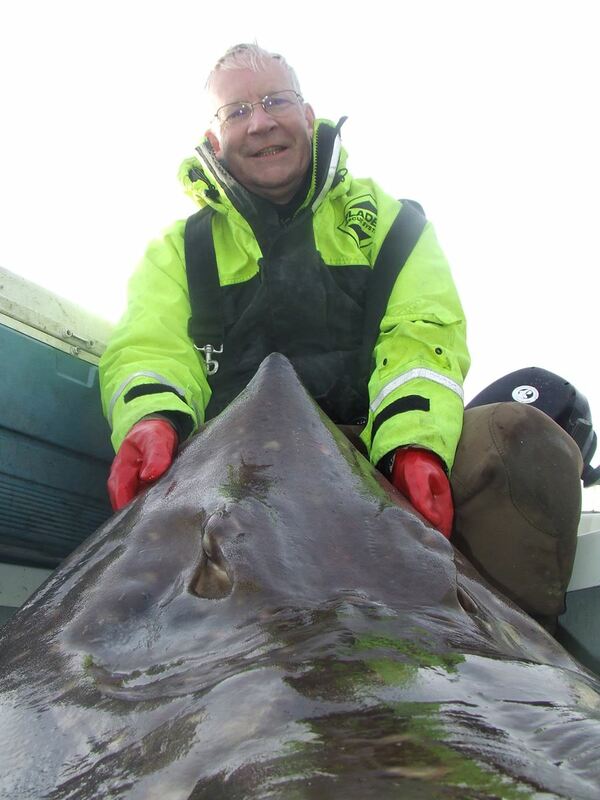 Despite the exertion from the earlier battle Trevor proved more than a match for this skate, and it was less than 20 minutes before it hit the deck – slightly smaller, at around 111 lbs, but still another good sized male. 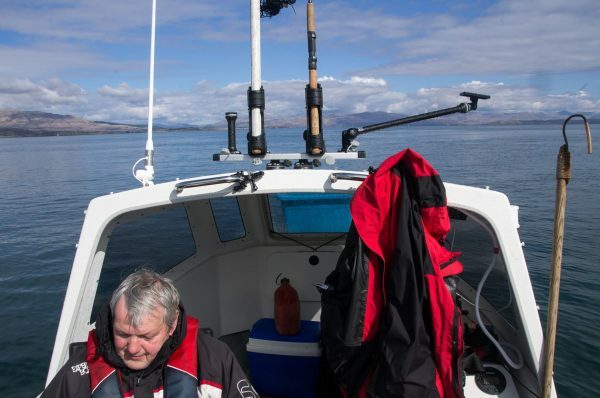 By now the tide had turned and the wind freshened so we decided to head inshore a bit as the rolling was getting very uncomfortable. 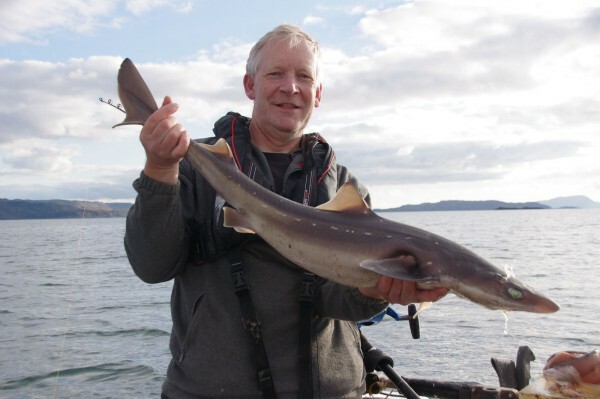 We gave it another couple of hours, but only one tiny spurdog appeared, so we called a halt a little earlier than planned and had a leisurely recovery back at the slip. So, a good call and good fishing on Trevor’s part, and crap on both counts for me! 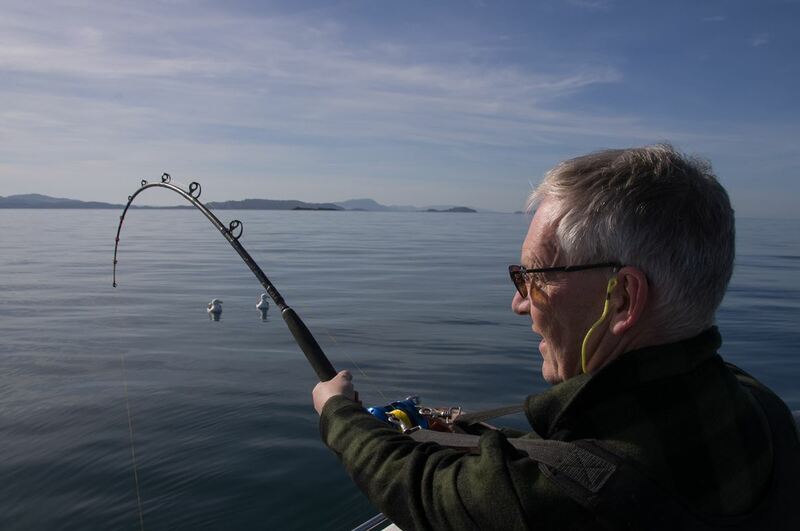 It’s been a couple of years since I last fished out of Oban, but the forecast was good and the tides small enough to have a reasonable stab at the skate grounds. Also it gave a chance to meet up with an old friend who I hadn’t seen for almost a decade and who was fishing the area for a few days from his own boat. Trevor had been at Loch Etive for a couple of days and was wanting to try somewhere different, but need to retrieve his boat from Taynuilt and get re-organised before heading down to the Puffin Diver’s, so I launched a few hours before him and lowered a large coalfish into a deep, deep hole close in to the west coast of Kerrera. Trevor appeared around 1 o’clock and proceeded to anchor up nearby, after establishing that my total catch was 2 doggies and no interest at all in the skate bait. Things stayed this way for another hour or so when the ratchet on the Avet screamed a warning and the heavy rod heeled over to the weight of a hungry skate over 500 feet below the boat. As usual I applied maximum pressure to the fish and, as usual, this made bugger all difference as it hugged the bottom and ignored my puny efforts. 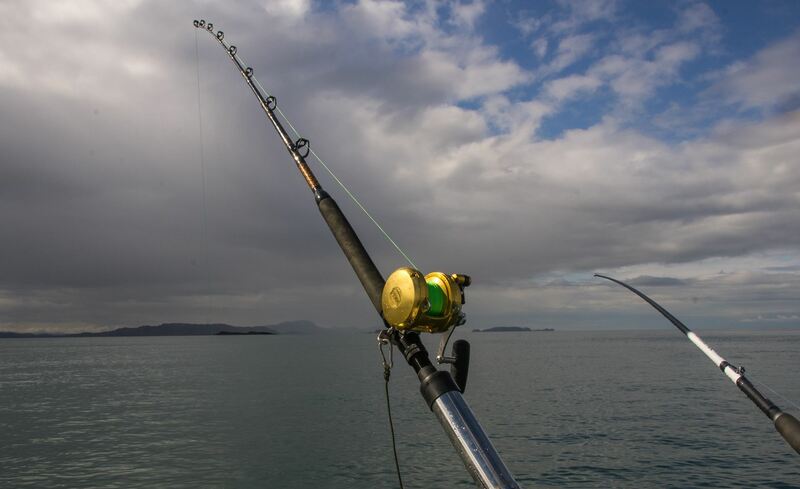 Eventually it grudgingly shifted a few feet and I broke it free of the bottom and started to gain line gradually – thanks goodness for the low ratio gear on the Avet, as it makes this sort of heavy duty fishing so much more bearable than a high speed reel. I didn’t have it all my own way, and the fish made several strong dives towards the bottom before a large shape glided up alongside the boat. Once alongside I checked for tags, but there were none showing, and then released her without bothering to try and get her aboard. Another couple of hours went by and I gradually recovered my breath and the thought of another back breaking fish no longer seemed quite so awful. 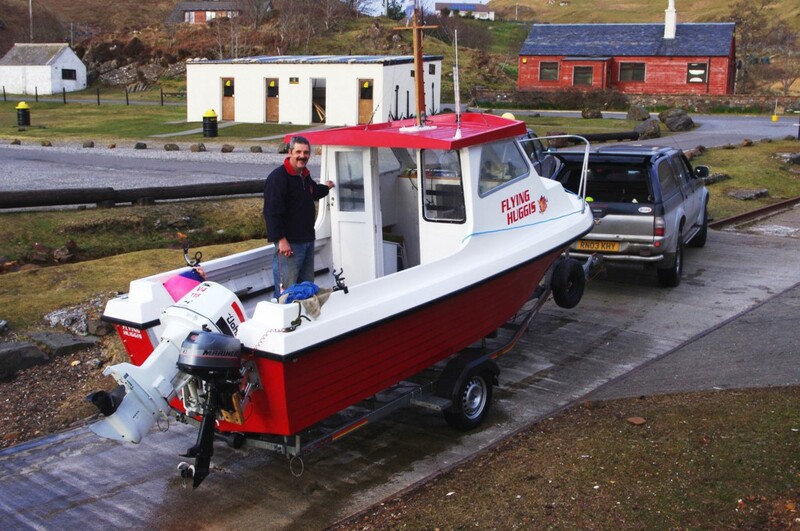 Trevor elected to head back to the slip at Puffin Divers as his battery was playing up and he couldn’t get his main engine started, so faced a slow run in on the aux. About an hour after he left the skate rod keeled over to the run of another fish and I braced myself for a repeat performance. Fortunately this skate wasn’t as big, so was that much easier to break clear of the sea bed and gradually pump up to the surface. Another female and again not one with a tag, this was clearly smaller than my first fish so I tried to get an idea of the wing measurement in order to get a rough weight. As you can imagine this proved pretty tricky, with one hand holding the measuring tape and one the fish, and the result gave a weight that was clearly too high. However it was pretty clear that this fish was the right side of 100lbs, which suggested the first one was around 150lbs as it was considerably bigger. 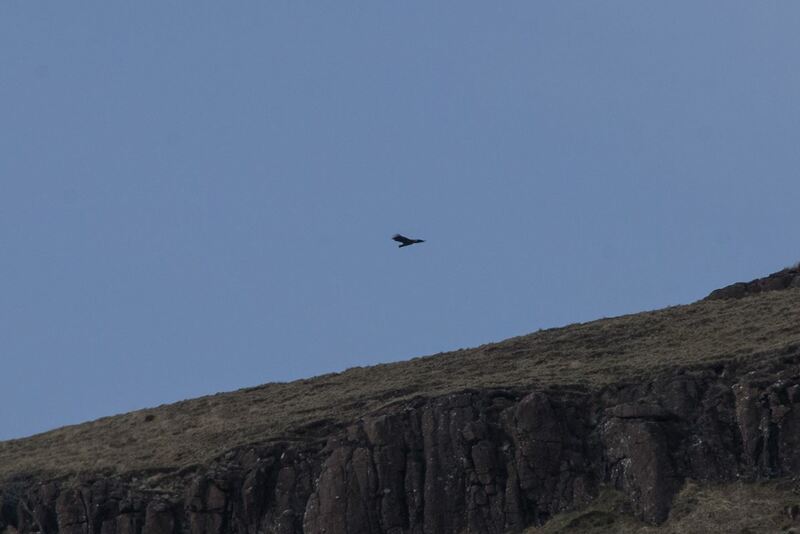 A quick one handed photo (not recommended, as you can see from the result) and away it went. 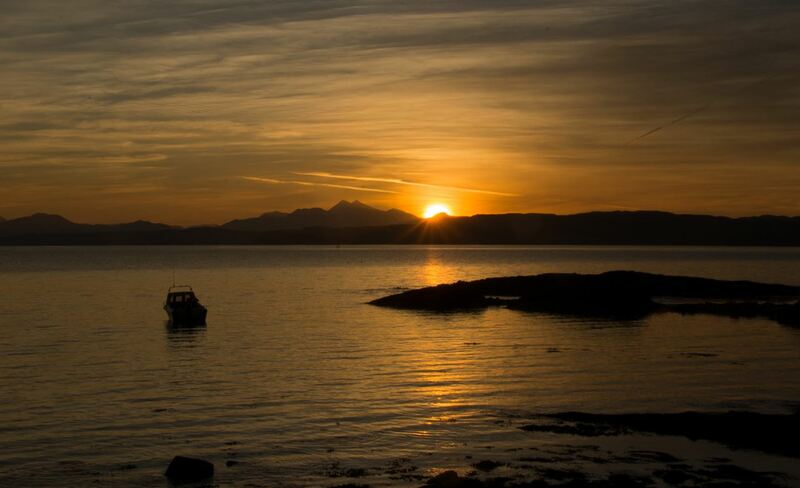 That was my lot – 2 skate, 1 small spur and 5 LSD – but I was happy enough as I hauled anchor and headed back along the south coast of Kerrera and dodged out the way of Macbrayne’s Islay ferry as it came down the Sound. The sun was setting on the shoreline, but with solid heavy cloud behind it so Kerrera and the ruin of the castle on its shoreline showed up beautifully, giving a fine end to the day. Taking advantage of a break in the winter weather Ian and I towed Alcatraz westwards to have a crack at Oban and the chance of a skate. 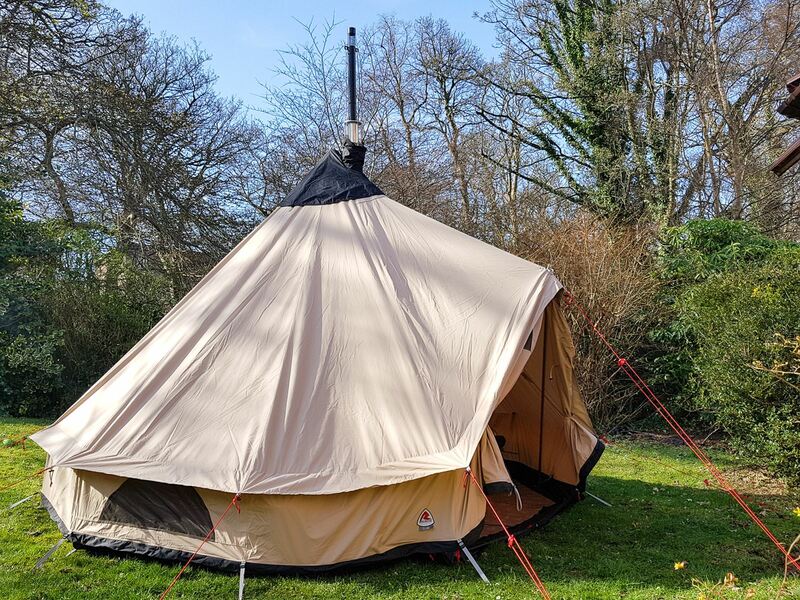 The wind was light but it was bl**dy chilly, so much so that my eTec decided to issue a “no oil” warning after a few minutes running – a first for me, but known to be an occasional problem in cold weather. Sorted out by a quick restart, and we were soon dropping the hook down to the seabed 530 feet below. We’d timed arrival for an hour or so before HW, but there was still a moderate tide running and a little hint of wind against tide. 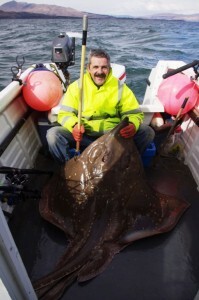 Nevertheless we got a pair of skate baits settled on the bottom and sorted out a welcome cup of soup. After an hour or so, and a little after HW, Ian’s rod had a nice run and he was soon into a good sized fish which was surfaced about 20 minutes later, after much huffing and puffing. The way the tide had been running the fish was actually lying in front of the boat, towards the anchor rope, which made playing it a bit more difficult. However, at 178lbs it was a good start for the year for both Ian and Alcatraz, and broke Ian’s long running duck at Oban. 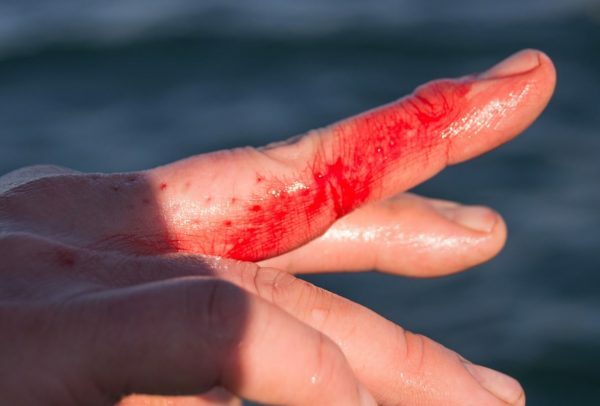 apart from showing me to be even more out of condition – it took an age to get it off the bottom and my back was constantly reminding me why skate fishing is a really silly idea. 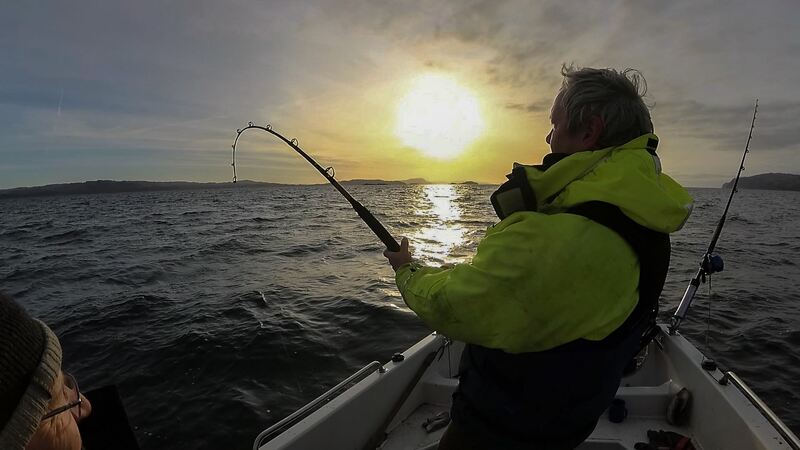 Nevertheless line gradually filled the reel again and eventually Ian got the chance to sink a gaff into the wing of what looked to be a very good fish. The fun started in earnest now because, try as we might, we couldn’t get the fish aboard. After a few attempts we gave up before we caused too much damage to ourselves or the fish and settled down to trying to measure it in the water. 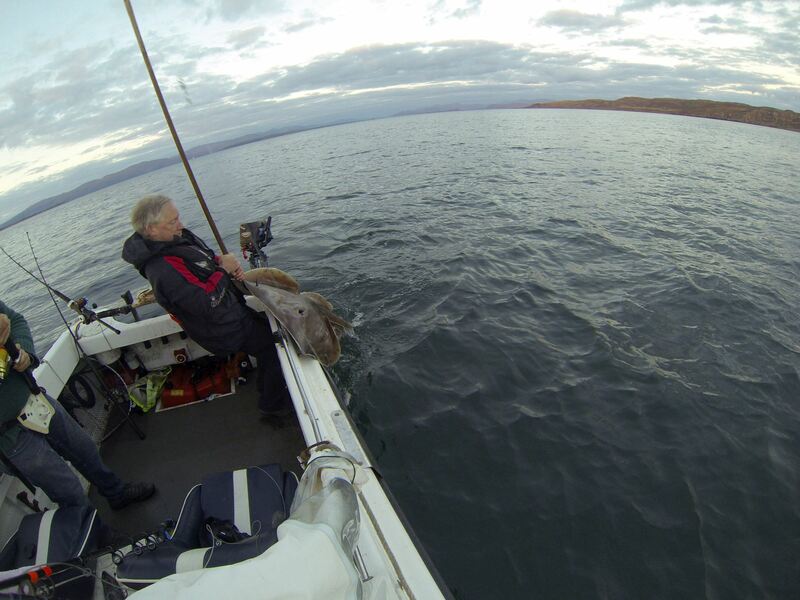 Length wasn’t too bad – after we got a rope around her tail we could hold her against the side of the boat and measure off against that. Width was much harder as we were measuring a rather slippery and curly underside but we got there in the end, despite almost joining the fish in the water a couple of times. Final result was a (reasonably conservative) 86″ x 69/70″, which I make to be around 203lbs or thereabouts and a lifetime personal best. Result!